Text: The first entertainment I recall, for which one had to pay, was a panorama display in the town hall. It was mainly educational and consisted of a series of enormous canvases depicting scenes from Switzerland and Italy passing across a stage from one roller to another. The scenes were brilliantly coloured and lit, and a man gave a running commentary as they passed across. Towards the end of the performance, he announced that for the first time in Newcastle actual moving pictures would be shown on a screen. I remember that the actors in them looked foreign and appeared to be moving in heavy rainstorms. A few years later, moving pictures were shown in our church hall for the benefit of children in the Band of Hope. I remember seeing the first epic film, The Great Train Robbery, and being terrified when the steam engine seemed to be coming off the screen and into the audience. Comments: Basil Peacock (1898-1991) was a dentist, a soldier, and a radio broadcaster, whose childhood was spent in Newcastle. There is more than a suggestion of mixed memories here. It is unlikely (if not impossible) that a panorama exhibition was combined with motion pictures, which were first shown on a screen in Newcastle two years before Peacock was born. 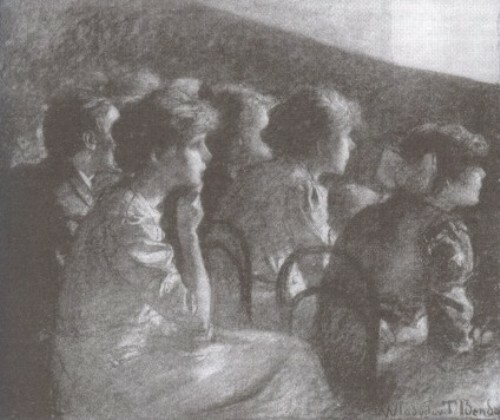 The 1903 dramatic film The Great Train Robbery does not feature a scene in which the train comes at the audience (an effect more commonly ascribed to the 1896 Lumière film L’Arrivée d’un train). This entry was posted in 1900s, Memoirs, United Kingdom and tagged Basil Peacock, Colour, Newcastle, Panoramas, Perfor, The Great Train Robbery (1903). Bookmark the permalink.